Chaharshanbe Suri (Fireworks Wednesday, 2006) is an Iranian domestic drama directed by Asghar Farhadi that outlines the strains and emotional agonies of an u rban couple in the course of a single day. It won the prize for best feature at the 42nd Chicago Film Festival in 2006. The title refers to the evening before the last Wednesday of the Iranian year, which traditionally sets off the Iranian New Year (“Nowrouz”) festivities that last for a few weeks. The activities on this night are part of the traditional Persian culture and predate the advent of Islam by at least two thousand years. Every year on that evening, Iranians set up fires on the streets all over the city, with boys eager to leap over them for the traditional good luck that it may bring. It is an evening full of brightly lit fires and firecrackers that boys tend to look forward to, and so it might compare a bit to the American Halloween. On the morning of this day at the beginning of the film, an innocent young woman, Rouhi, who is engaged to be married later that week, gets a ride on the back of her fiance’s motorcycle to the cleaning agency where she works. Her assignment that day is to clean the apartment of a middle class couple, Morteza and Mojdeh, and it doesn’t taker her long to see that the couple are seriously quarreling. The rest of the film traces the marital struggles that this couple undergoes, as seen primarily from the eyes of Rouhi. The focalization is not exclusively on Rouhi, though, and the viewer sometimes views separate scenes from the perspectives of Morteza and Mojdeh. The details of what lies behind the couple’s problems are revealed only gradually, through slow disclosure, and after awhile it becomes more clear that Mojdeh is jealous of her husband’s suspected infidelity with an unmarried beautician, Mrs. Simi, who lives and works in the next-door apartment. Rouhi, enthralled as she is with romantic dreams about her upcoming marital bliss, is appalled to see how Morteza and Mojdeh treat e ach other. Mojdeh is temperamental and obsessively bad-tempered towards her husband. Morteza, in turn, is abrupt, rude, and insensitive towards his wife’s worries, which he views as obsessive jealousy. It is not simply a case of bickering, but one of seething mutual hostility. Little by little, Rouhi finds herself getting involved in the machinations of this argument. She is lured by Mojdeh into visiting and spying on Mrs. Simi for an eyebrow trim. Subsequently she repeatedly and inadvertently makes innocent comments concerning what she has heard in separate conversations with Mrs. Simi, Morteza, and Mojdeh, and those comments are leapt upon by each of her interlocutors as suspicious evidence of potential malfeasance by someone else. The basic problem, as it is in all societies East and West, is due to, or at least exacerbated by, the relatively restrictive stereotypical roles that are assigned to everyone in adult society. Husbands often expect their wives to play the role of the perfect self-sacrificing homemaker, while wives expect their husbands to attend to all of their wives' whims and perpetually to place their wives at the center of their attention. Because of the commonality of such situations everywhere, the basic social issues of role expectations and marital infidelity are virtually universal and apprehensible to everyone. But despite this universality, the film does not take on the fundamental and even more universal philosophical issues that have underlain some of the most profound Iranian cinematic works. After awhile, in fact, the viewer might begin to get a little impatient with the overwrought histrion ics of the sparring married couple in this film. So it is something of a relief when Rouhi sometimes spends time in the company of the more benign and understanding Mrs. Simi. Mrs. Simi, we later learn, has her own personal difficulties, but she is able to see the positive side of all situations. The viewers’ sympathies are thus much more likely to lie with Rouhi and Mrs. Simi than with the discordant Morteza and Mojdeh. In the end there is a resolution of sorts to the problem, although the viewer may have his or her doubts. The acting in Chaharshanbe Suri is good, though it occasionally borders on the theatrical. Taraneh Alidoosti, as the ingenue Rouhi, has a winning smile, but any character development on her part during the film is obscure, and she may be playing more for the camera than for the story. She does make a dramatic intervention that affects the relationship between Morteza and Mojdeh, but her motivations are not entirely clear. 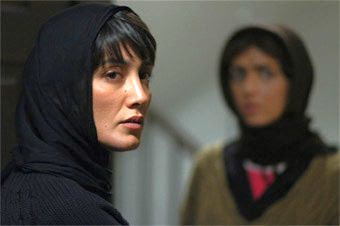 Hedye Tehrani, in the difficult role of Mojdeh and who also played in Ghobadi's Half Moon, manages to maintain a believably restrained intensity throughout. The mostly hand-held cinematography is reasonably smooth and exhibits the kind of visual creativity often required to make a film in urban Iran, with all the various restrictions that such a setting can entail. Peyman Yazdanian's music contributes to the melancholy mood of the story. The significance of the title, “Chaharshanbe Suri”, to the thematic content is not very evident, other than to suggest the pyrotechnics on display between the married couple. But an interesting culture-specific detail is displayed on the occasion when Mojdeh steals Rouhi’s chador (full veil) in order to go spying on her husband in “disguise”. As a middle-class woman, Mojdeh normally wears “rusari” (modest clothing with head scarf) and apparently doesn’t even own a chador. My only quarrel with the film is that while it lays bare the problems of marital life, it does not seem to come to a satisfying narrative resolution. There are suggestions at the close of the film that Rouhi may have to face her own difficulties in connection with what her husband will expect from her in the future, even though he is infatuated with her now. So what has Rouhi learned after the day’s experiences, and how might they prepare her for the future? At the end of the film, Rouhi is almost about to meddle one more time and spill the beans, thereby erasing her earlier benevolent intervention. What does that tell us? And what is the future of Morteza and Mojdeh? The seas are relatively calmed at the close of the film, but troubled waters probably lie ahead for everyone. Nice review. Just some points. Mrs Simi, I believe is a divorcee and unmarried as you have mentioned. You also mention Mojdeh is jealous of Morteza. But I don’t find any such thing in the movie. She is suspicious, yes, but jealous, is a far fetched interpretation.But still a nice review. I found the movie a satisfying watch. The way Farhadi juxtaposed the dreams of a to be married person with the grave realities of married couple.